We strongly promote safe cycling. Ride participants are expected to obey all traffic laws and show courtesy to other riders and motorists. Riders younger than 16 years are welcomed when accompanied by a parent or guardian: riders under 18 may ride on their own, but must have approval of a parent or guardian. If you would like to join the club please go to our membership page. Executive Council members are elected at an annual meeting held in late winter and serve a one year term. The club has a Facebook page where members can interact with each other. Late breaking club news is also posted there as well as on this webpage. For the Facebook page you need to have a Facebook account: although the page is public, only club members are allowed to post to the club page. The club hosts several social events during the year including a picnic in the summer and dinner in the fall. The annual club meeting is held late winter and is a mix of socializing and discussing the club’s business. Details of these events are published on this website and on the Facebook page. 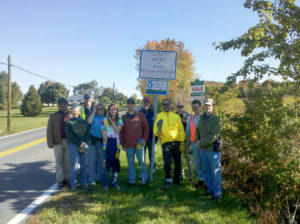 Frederick Pedalers pose in front of the sign on Bethel Road after a successful trash pickup. The Frederick Pedalers Bicycle Club was one of the first organizations in Frederick County to participate in the newly formed Adopt-A-Road program in 2002. The club has ‘adopted’ a 1.5 mile stretch of Bethel Road between Opossumtown Pike and Mountaindale Road and performs roadside pickups of trash and debris several times per year. The Frederick Pedalers Bicycle Club has a club-wide membership with RidewithGPS. Club members are entitled to premium access to this site, which provides access to existing routes, and allows for route planning, the printing of route cue sheets, and downloading of turn-by-turn data to Garmin, Wahoo and similar devices. • One of the first organizations to participate in Frederick County’s Adopt-A-Road Program.